In this recording, best-selling author Tina Payne Bryson (co-author with Dan Siegel of The Whole-Brain Child) discusses how to increase the effectiveness of your treatment by working with parents to reduce the backwards steps taken when a child leaves the therapy office or classroom. 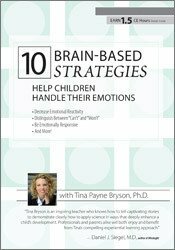 Using stories, case examples, and plenty of humor, Dr. Bryson explains ten simple, scientifically grounded strategies that will help children handle their emotions and make better decisions-even in high-stress moments. You will learn how to accurately assess a child’s temperament and the key questions to provide a great understanding of family dynamics and parenting styles. Walk away from this recording with the tools to improve outcomes by working more effectively with the entire family as part of the process. Multi-disc audio recording (1 hour, 30 minutes) with electronic manual and instructions. Explain why emotional responsiveness is an essential intervention strategy for developing the brain and creating long-term mental health and resilience. Distinguish the connection between reactivity and the threat-detection system in the brain. Identify when parents need to make shifts at home, versus when a child actually needs therapy. Demonstrate how to reinterpret seemingly maladaptive behavior as purposeful, adaptive behavior with a meaning, then learn how to shift it. Describe how to communicate these basic concepts to parents. How much does context matter? Tina Payne Bryson, Ph.D., is the co-author (with Dan Siegel, M.D.) of two New York Times bestsellers: The Whole-Brain Child (Bantam, 2012) and No-Drama Discipline (Bantam, 2016), as well as The Yes Brain (Bantam, 2019). Dr. Bryson is also the co-author (with Dan Siegel, M.D.) of The Whole-Brain Child Workbook (PESI, 2015) and No-Drama Discipline Workbook (PESI, 2016). 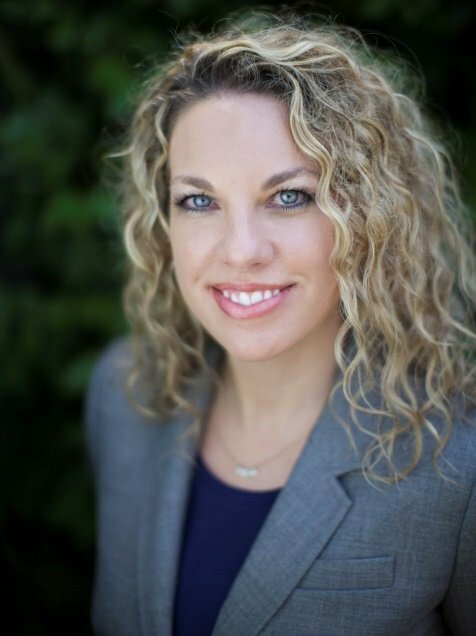 She is the executive director of the Center for Connection in Pasadena, CA and a pediatric and adolescent psychotherapist. She keynotes conferences and conducts workshops for parents, educators, and clinicians all over the world. Dr. Bryson earned her Ph.D. from the University of Southern California, where her research explored attachment science, childrearing theory, and the emerging field of interpersonal neurobiology. This intermediate self-study activity consists of 1.5 clock hours of continuing education instruction. Credit requirements and approvals vary per state board regulations. Please save the course outline, the certificate of completion you receive from the activity and contact your state board or organization to determine specific filing requirements. South Carolina Counselors, Marriage & Family Therapists and Psycho-Educational Specialists: This program has been approved for 1.5 continuing education hours by the South Carolina Board of Examiners for Licensure of Professional Counselors, Marriage and Family Therapists, and Psycho-Educational Specialists. Provider #4540. Texas Counselors: PESI, Inc. has been approved as a continuing education sponsor through the Texas State Board of Examiners of Professional Counselors. Provider #: 2477. This self-study course qualifies for 1.5 continuing education credits. Vermont Counselors: This program is approved by the Board of Allied Mental Health Practitioners (BAMHP) for 1.5 continuing education credits. This course consists of 1.5 self-study clock hours. Credit requirements and approvals vary per state board regulations. Please save the course outline, the certificate of completion you receive from this self-study activity and contact your state board or organization to determine specific filing requirements. 1.5 ISBE Professional Development (PD) Clock Hours will be made available through Quincy University. Those requesting ISBE PD Clock Hours will need to complete additional steps in order to receive the ISBE “Evidence of Completion for Professional Development” form. Expires: 06/30/20**. Indiana Educators: 1.0 Professional Growth Points are available for full attendance of this self-study package per the Indiana Department of Education standards. Montana Educators: This self-study package is offered for 1.5 Renewal Units. PESI, Inc. is an Approved Renewal Unit Provider with the Montana Office of Public Instruction. New Jersey Educators, Administrators & Education Services Personnel: 1.5 Actual Professional Development Hours (self-study). MEDS-PDN, powered by PESI, Inc., is a registered New Jersey Professional Development Provider with the NJ Dept of Education. Texas Educators: PESI, Inc., has been approved as a CPE Provider #500-981 for Texas Educators by the Texas State Board for Educator Certification (SBED). This self-study package qualifies for 1.5 CPE clock hours. This self-study activity consists of 1.5 clock hours of continuing education instruction. Credit requirements and approvals vary per state board regulations. Please save the course outline, the certificate of completion you receive from this self-study activity and contact your state board or organization to determine specific filing requirements. Illinois Marriage & Family Therapists: PESI, Inc. has been approved as a provider of continuing education by the State of Illinois, Department of Professional Regulation. Provider #: 168-000156. Full attendance at this self-study activity qualifies for 1.5 credits. Texas Marriage & Family Therapists: PESI, Inc. has been approved as a continuing education sponsor through the Texas State Board of Examiners of Marriage and Family Therapists. Provider #: 503. This self-study activity qualifies for 1.5 continuing education credits. This intermediate activity consists of 1.5 clock hours of continuing education instruction. Credit requirements and approvals vary per state board regulations. Please contact your licensing board to determine if they accept programs or providers approved by other national or state licensing boards. A certificate of attendance will be awarded at the end of the program to participants who are in full attendance and who complete the program evaluation. California Nurses: PESI, Inc. is a provider approved by the California Board of Registered Nursing, Provider #:17118 for 1.5 self-study contact hours. Florida Nurses: PESI, Inc. is an approved provider by the Florida Board of Nursing. Provider #: FBN2858. These materials qualify for 1.5 self-study contact hours. Iowa Nurses: PESI, Inc. is an approved provider by the Iowa Board of Nursing. Provider #: 346. Nurses successfully completing these self-study materials will earn 1.8 self-study contact hours. PESI, Inc. is an AOTA Approved Provider of continuing education. Provider #: 3322. This self-study course qualifies for 1.5 self-study contact hours or .15 CEUs in the Category of Domain of OT and Occupational Therapy Process. The assignment of AOTA CEUs does not imply endorsement of specific course content, products, or clinical procedures by AOTA. Course Level: Intermediate. Expires: 5/14/2019. Florida Occupational Therapists & Occupational Therapy Assistant: PESI, Inc. is an approved provider with the Florida Board of Occupational Therapy. Provider Number 50-399. This self-study course qualifies for 1.5 continuing education credits. This self-study course consists of 1.5 clock hours of instruction that is applicable for physical therapists. CE requirements for physical therapists vary by state/jurisdiction. Please retain the certificate of completion that you receive and use as proof of completion when required. California Physical Therapists & Physical Therapist Assistants: PESI, Inc. is recognized by the Physical Therapy Board of California as an approval agency to approve providers. This self-study lecture qualifies for 1.5 continuing competency hours. Illinois Physical Therapists & Physical Therapist Assistants: PESI, Inc. is a Registered Physical Therapy Continuing Education Sponsor through the State of Illinois Department of Financial and Professional Regulation, Division of Professional Regulation. License #: 216.000270. This self-study course qualifies for 1.5 CE credit hours. New York Physical Therapists & Physical Therapist Assistants: PESI, Inc. is recognized by the New York State Education Department, State Board for Physical Therapy as an approved provider for physical therapy and physical therapy assistant continuing education. This self-study course qualifies for 1.8 contact hours. This self-study activity consists of 1.5 clock hours of continuing education instruction. Credit requirements and approvals vary per state board regulations. Please save the course outline and the certificate of completion you receive from this self-study activity. Contact us for more information on your state board or organization specific filing requirements. American Psychological Association credits are not available. Florida Board of Psychology: PESI, Inc., is an approved provider with the Florida Board of Psychology. Provider Number 50-399. This product qualifies for 1.5 self-study continuing education credits. Please make sure to bring your license number to the seminar so that we can report your attendance to CE Brokers. This course contains 1.5 hours of self-study continuing education. It was not offered for ASHA CEUs. Please retain your certificate of completion. If audited for ASHA Certification Maintenance, you can submit this certificate of completion at that time. For state licensure, teacher certification renewal, or other credential renewal, contact those agencies for information about your reporting responsibilities and requirements. California Speech-Language Pathologists/Audiologists: PESI, Inc. is an approved provider with the California Speech-Language Pathology and Audiology Board, #PDP 319. This course meets the qualifications for 1.5 hours of self-study continuing professional development credit for Speech-Language Pathologists or Audiologists, as required by the California Speech-Language Pathology and Audiology Board. Kansas Speech-Language Pathologists: Approved for 1.5 self-study continuing education clock hours for Kansas licensed Speech-Language Pathologists by the Kansas Department for Aging and Disability Services. California Social Workers/ Counselors/Marriage & Family Therapists/Licensed Educational Psychologists: This intermediate activity consists of 1.0 clock hours of continuing education instruction. Credit requirements and approvals vary per state board regulations. Please contact your licensing board to determine if they accept programs or providers approved by other national or state licensing boards. A certificate of attendance will be awarded at the end of the program to participants who are in full attendance and who complete the program evaluation. Florida Social Workers/Marriage & Family Therapists/Mental Health Counselors: PESI, Inc. is an approved provider with the Florida Board of Clinical Social Work, Marriage and Family Therapy and Mental Health Counseling. Provider Number 50-399. This self-study course qualifies for 1.5 continuing education credits. Illinois Social Workers: PESI, Inc. is an approved provider with the State of Illinois, Department of Professional Regulation. License #: 159-000154. Successful completion of this self-study activity qualifies for 1.5 contact hours. Kansas Social Workers: PESI, Inc. is an approved provider with the Kansas Behavioral Sciences Regulatory Board. Provider #14-006. This self-study course has been approved for 1.5 continuing education hours. Minnesota Social Workers: PESI, Inc. is an approved provider with the State of Minnesota, Board of Social Work. Provider #: CEP-140. This self-study course has been approved for 1.5 continuing education hours. A certificate will be issued upon successful completion of a post-test. New York Social Workers: PESI, Inc. is recognized by the New York State Education Department's (NYSED) State Board for Social Work as an approved provider of continuing education for licensed social workers #SW-0008. This self-study activity will qualify for 1.75 contact hours. Full attendance is required; no partial credits will be offered for partial attendance. Expires: December 31, 2020. Ohio Social Workers/Counselors/Marriage & Family Therapists: PESI, Inc. is an approved provider with the State of Ohio Counselor, Social Worker and Marriage & Family Therapist Board. Provider approval #: RCST071001. Successful completion of this self-study course meets the qualifications for 1.5 clock hours of continuing education credit. Pennsylvania Social Workers/Counselors/Marriage & Family Therapists: This intermediate activity consists of 1.5 clock hours of continuing education instruction. Credit requirements and approvals vary per state board regulations. Please contact your licensing board to determine if they accept programs or providers approved by other national or state licensing boards. A certificate of attendance will be awarded at the end of the program to participants who are in full attendance and who complete the program evaluation. Full attendance is required, variable credits may not be awarded per the Pennsylvania State Board. This self-study activity qualifies for 1.5 clock hours of instructional content as required by many national, state and local licensing boards and professional organizations. Retain your certificate of completion and contact your board or organization for specific filing requirements.